As usual, I have been up to absolutely no good. This is the future home a slightly different kind of art store. I’m going to feature the works of a few close and amazing artists. What does it take to be included? Be amazing can help, and tell me what kinds of world-saving, superhero antics go into your art, lifestyle, or general attitude. This is obviously VERY far from its finished form, but you can kinda see where it’s going. What’s really incredible isn’t so much that it’s a hand-sculpted 3D Celtic knot; it’s that it will ultimately be cast in reclaimed aluminum. In fact, my personal goal for all of my wearable pieces is to use zero raw materials, only reclaimed and recycled. I have all kinds of nefarious plans for these tokens and more. I have a bunch of old electronics begging to be art, plus a number of prints and paintings. Everything is as eco-conscious as possible. But, it’s not just me in this. I may be a ringleader, but I’m also kind of lazy sometimes. That’s why I have other people to throw in their stuff. I’m not going to tell you to check back regularly because that’s just silly. How about if we call you? Can we call you? Drop your email address in the subscription field over there on the right (is it on the right? I should check that…) and you’ll get a message whenever something exciting happens. It won’t be very often – not for a while anyway. A big part of the nefarious plan is to ultimately have a significant presence at festivals, conventions, and faires. Once that happens, we’ll have an ongoing calendar of our appearances and whose work will be on display for each event. More questions? 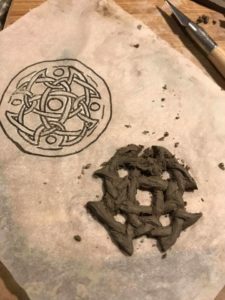 Wondering where you can get some sweet Celtic knotwork? Email me and I’ll see what I can do. Prints, posters, and tattoo designs are not out of the question.